Two steel-framed commercial blocks will provide a central element to a prestigious mixed-use development taking shape on London’s south bank. Martin Cooper reports. Steel tonnage: 6,300tOne of the largest construction projects to be undertaken in central London this century is currently under way on the south bank of the River Thames. Situated between the London Eye and busy Waterloo Station, Southbank Place covers an area of more than 20,000m² and consists of two commercial blocks, and six residential towers along with new retail units, restaurants and cafés, all of which are located around the existing Shell Tower, which will become one of the centerpieces when the project completes in 2019. The two new commercial office blocks, known as One and Two Southbank Place are both steel-framed structures, containing 11 floors and 17 floors respectively. 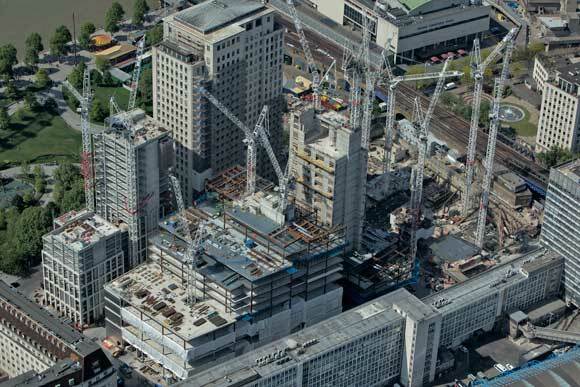 Apart from one residential tower, the two commercial structures are the first buildings to take shape on what is already a very busy and logistically challenging site. Faced with the usual traffic, noise and lack of space all inner-city projects have to cope with, Southbank Place will eventually have a maximum workforce of 1,600 people. The steel erection has been carried out immediately behind the large-scale groundworks programme, which is currently progressing throughout the site. Viewed from outside of the hoardings, the project is a forest of tower cranes – there are currently 16 cranes – needed to feed and lift the various materials being used. 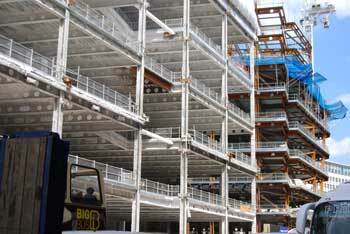 Severfield began its steel erection programme in January. Work was able to commence once the concrete formed basements were completed, along with the slip-formed cores. Building One has two cores, a main core that reaches the full height of the structure, and a secondary satellite core that only serves the lowest five levels. Building Two has just the one centrally-positioned core. The tube line actually passes under the structure’s south eastern corner and consequently no piles could be installed in this area. In order to not position columns over this important transport link, this corner, that houses the main entrance of the building, slopes inwards from the sixth floor down, with the aid of two raking columns. These raking columns make the building structurally pull itself towards this corner. To counterbalance this, temporary bracing has been installed, which has to remain in position until the structure’s floors are complete. Both buildings have used cellular beams throughout for efficient service integration. However, unlike Building One, which has some internal columns, Building Two has none, with clear uninterrupted spans reaching a maximum length of 17m. The north and west elevation of Building Two features a series of outdoor spaces accommodated on 2m-wide cantilevers. These spaces extend upwards from level 6, and they are formed by two further raking columns positioned at fourth floor level that extend up to the underside of the sixth floor. The uppermost floor of Building Two is known as the entertainment area. Formed with 12m-high elliptical members, it is a glazed pavilion that is set back from the floors below and offers access to a rooftop terrace. Adjacent to this feature the structure also has a rooftop two-storey plant enclosure. Meanwhile, Building One’s standout feature are the five further outdoor terraces, formed as the structure steps in at levels five, eight and nine, and Level 11 is a plant space. Both blocks will have different cladding systems, with Building Two finished with curtain walling, and One predominantly clad with large precast panels weighing up to 12 tonnes each. Both buildings are aiming to achieve a BREEAM “Excellent’ rating, and are due to complete towards the end of 2018. The project is one of the first to be operating as an Ultra Site under the Considerate Constructors Scheme. Richard Henderson of the SCI discusses the challenges of connecting structural steel to concrete cores – the motivation for a forthcoming publication on the subject commissioned by Steel for Life. Members of the public passing the Southbank Place development cannot fail to notice the cranes – but structural engineers will note the cellular beams and the several concrete cores which currently dominate the site. The connections to the cores are achieved by welding attachments to cast in steel plates positioned as the cores were constructed. These sorts of connections are full of challenges – including the accommodation of tolerances, the achievement of the design intent, which is often nominally pinned behaviour, and the transfer of the forces from the plate into the core walls. The Southbank Place development also includes inclined columns, so some connections must transfer both shear and tension concurrently. The design of nominally-pinned connections is covered by the Green Book on Simple Joints¹. These joints are not designed for coincident vertical and horizontal forces, as the tying check is entirely separate to the verification for the vertical loads. The necessary rotation of the joint is achieved primarily by bearing deformation in the bolt holes. 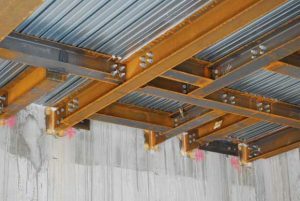 Real axial loads in beams, from inclined columns, or because of voids in the floor plates around the core, mean connections must be designed for concurrent axial and vertical loads – and are thus immediately outside the provisions in the Green Book. Perhaps more significantly, the axial load may demand substantial connection components, which will certainly make the joint stiffer. Without careful thought, the joint may not behave as the assumed nominal pin. 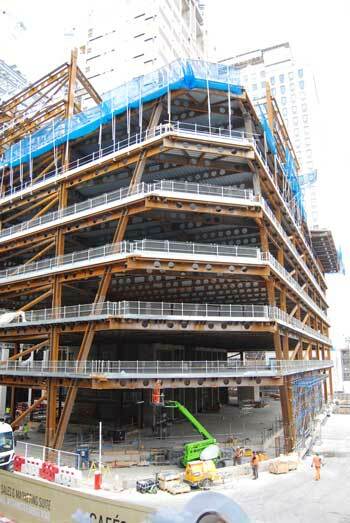 The necessary provision to accommodate core construction tolerances may mean that the eccentricity of the vertical load is significantly more than commonly assumed, increasing the moment applied at the joint. Embedded plates are cast in with arrangements of shear studs and reinforcement connected to the back of the plate. A clear design model is needed – which components transfer the vertical force, and which carry the axial/tying force and the inevitable moment? For the concrete designer, there is the challenge of transferring these forces into the core, often through congested reinforcement. Professional interfaces also have an impact on the design of the joint between steel and concrete. The structural engineer generally determines the steel and concrete member sizes, designs the concrete structure and provides connection forces to design the connections. At the embedded plate, the design responsibilities of the two parties come together, with local forces to be transferred to the core concrete being dependant on the detail developed – perhaps by the steelwork contractor working in isolation. This discussion describes some of the very real challenges with connections to cores which have been addressed at the Southbank Place development. Guidance on how to manage this important interface will appear later this summer in a new design guide commissioned by Steel for Life.